Yes, it does seem that foodie flicks are all the rage these days. It has been a veritable feast lately and now we have one more to add to our plates. than a quarter of an acre, while running a popular website that is known around the world. The film is an intimate human portrait of what it's like to live like "Little House on the Prairie" in the 21st Century." This film is showing in very limited release in our area. Check it out SATURDAY at the Westcott Community Center. Showings are at 10:30 am and 12:30 p.m. only. I'll be away doing continuing education and won't be able to make it, so if you go post a comment and tell us all about it. For more information about the film check out the website here. Big thanks to our friends at the Alchemical Nursery Project for bringing this film to the 'Cuse! Last week I went to see Julie and Julia. It was a great food movie--I laughed. I cried. I remembered how much I enjoyed watching Julia Child as a seven year old playing in front of my Suzy Homemaker oven. I teared up watching the scenes of her sister, Dorothy, who was a member of a church I interned at in Sausalito. I plan to get the DVD (or whatever it is people watch movies on nowadays). Food Inc. is another must-see movie. I haven't seen it yet but I know I'll probably laugh a good deal less and cry a good deal more over it. It is playing in very limited release in Auburn over the two weekends--mark your calendars and make the trip. Here are the details--scroll down for the movie description. "Food, Inc.", an eye-opening movie about the industrialization of farming and food production, will be shown over 2 weekends at the Auburn Public Theater in downtown Auburn, NY. All showings at 8PM. $5 at the door or $4 on-line purchase here. 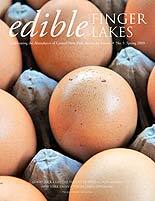 Information will be available about how you can buy and enjoy foods that come from healthy, sustainable farms and businesses, as well as updates on legislation in Washington and Albany about school meal programs. The movie theater is quite small, so come early or buy your tickets on-line to guarantee a seat. Show times are Friday at 7:30, Saturday and Sunday at 2:00, 5:00; and Monday through Thursday at 7:30. Hat Tip Amber--from the comments. Hat tip to Glenda Neff! Ever since I saw the first trailers for No Reservations, I knew I had to see it first thing. This American adaptation of the 2002 German film, Mostly Martha, stays pretty close to the original story line--right down to the pregnant sous chef, Lea, who sports a supershort hair style--but with some notable exceptions. Now let me say up front--I love Mostly Martha. It ranks right up there with Sideways for the most frequently viewed food/wine DVD in our house. Funny thing is, I didn't love No Reservations in quite the same way and I think it had something to do with the translation of the film for an American audience. In many ways, this film is an unconventional love triangle between a woman, a man and a child that takes place mostly in a restaurant. It is fascinating to watch this incredible chef who is wound so tight she can't even eat her own food, gradually unwind as a child and a love interest crash into her life and begin to open her heart. Beyond that, if you want details about the romance plot of the film you'll have to check one of the real reviews. I'm struck more by the food, aesthetics, and American concessions that were made in producing this new version. In No Reservations, the restaurant has been transformed from the Lido to 22 Bleecker--on a corner in the West Village of Manhattan. Both films are shot with a beautiful austerity that, in the way of white plates, allows the food to take a starring role. But in typical American style, protagonist Kate Armstrong's apartment is larger and a bit more rich in texture than Martha Klein's flat. There were other nuances that I missed from the original. For instance, when Mario begins cooking in Martha's kitchen in the German film, the conflict is not that he would begin cooking Italian food, the unspoken conflict is that he himself is Italian. On the other hand, the cooks in Kate's kitchen are more racially and ethnically diverse--a more authentic representation of an American restaurant. Another quibble: Kate takes a couple of pre-dawn trips to the Fulton Fish Market and we are treated to views of the Brooklyn Bridge. This would have been right on two years ago, but my beloved fish market relocated from South Street Seaport to the Hunts Point section of the Bronx in 2005. I was delightfully surprised, though, by how similar the food remained in this adaptation. No Reservations begins with the quail (pigeon) soliloquy as in the original and scallops,fois gras, lobster, rack of lamb, dover sole, duck, and sea bass appear on the menu. In Mostly Martha the menu features scallops, lobsters, lamb, artichoke dishes, arugula salad, and rabbit along with the infamous quail with truffles. But there is also handmade pasta and gnocchi on Martha's menu and one of the controversies chef Mario brings with him is the concept of preparing fish and more lighter fare. By the way, you can download recipes for the quail with truffles and poached lobster in butter, among others from the movie website--click here. In the end, however, I was left slightly disturbed by the changes made, I presume, to make this film more palatable to the American movie goer. Small things, like the flood of stuffed animals and toys that comes to Zoe when she first arrives seems like a bow to our consumerist culture--and that she has her own room--in the German version, Martha gives up her bedroom for little Lina. In the American version it is notable that it is the divorced neighbor who makes the first move on Kate and not the other way around as it happens in the original--we are not used to seeing Catherine Zeta-Jones being rebuffed, I guess. But the biggest issue I had with the film was the plot line that revolved around Lina's desire to find her father--a man whom she had never met. It is this task that first brings Martha and Mario together in the German film. In No Reservations, this story line is completely absent which really makes the movie about Kate and Nick and Zoe's efforts to bring them together. It is a cute and entertaining film, though, and it does wonders for reminding us of the pressure and craziness of the restaurant kitchen that we rarely get to see. It also makes the kitchen seem glamorous enough to inspire more folks to enroll in culinary school--a tough and expensive route that doesn't always lead to places like 22 Bleeker. But if you are looking for eloquent food and cooking metaphors for the difficulties and joys of life be sure to check out the Mostly Martha DVD. We are headed into the busy season around here and like many of you, I'm trying not to get that running around like a crazy person glaze over my eyes. So I was delighted to find myself in front of a big screen last night to just sit and be entertained--and educated. 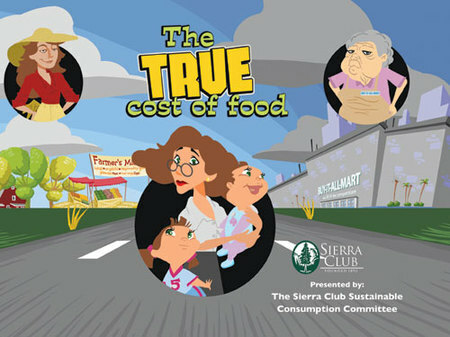 One of the short films I watched was a really short animated pic called the True Cost of Food. If you want to get across the importance of eating locally and understanding the hidden but very real costs of industrialized food production while laughing--this is the film for you. It's just 15 minutes long and an even shorter version (7 minutes) can be downloaded if you have a slower connection. Check out both versions here and click on "See the Movie". Speaking of industrialized food production--have you seen Fast Food Nation yet? I hope to check it out on Friday.